Boca Juniors versus River Plate is already one of the most anticipated games in South American football, but the next two meetings between the fierce rivals will take things to a whole new level. For the first time in history the two Buenos Aires heavyweights will go head-to-head in the Copa Libertadores final, starting with Saturday's match at La Bombonera. The two sides have met 24 times in the Libertadores with Boca claiming 10 victories to River's seven, but Los Millonarios have won the last three encounters in all competitions – all away from home. Here we look at six of the best Superclasico meetings ahead of a clash that has gripped world football. Boca travelled across the city with a 1-0 lead from the first leg of their Copa Libertadores semi-final, and knew a solid away display could send their rivals tumbling out at the penultimate hurdle. 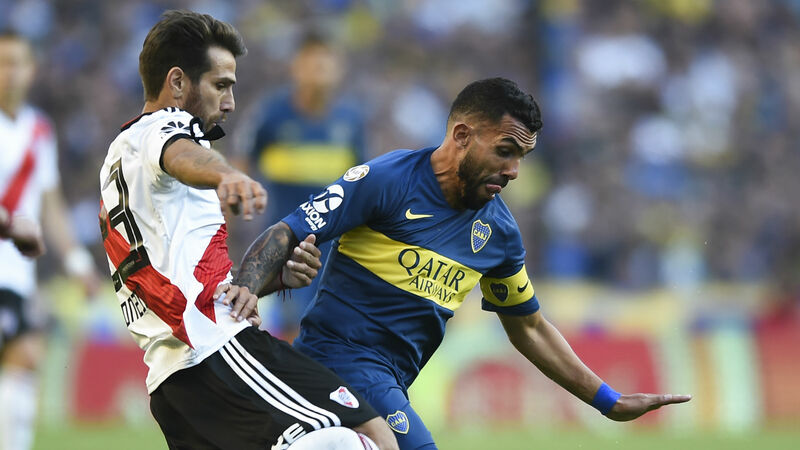 Their advantage was wiped out early in the second half when Luis Gonzalez gave River the lead, but Carlos Tevez thought he had won it with an 89th minute equaliser on the night. Tevez's celebration – that saw him imitate a chicken – earned him a red card, and in the subsequent added on time Cristian Nasuti levelled the aggregate score, taking the semi to penalties. In the shootout it was 10-man Boca who prevailed 5-4, but they were not so lucky in the final when they lost 2-0 on spot kicks against Once Caldas. The last time the sides met in the Copa Libertadores ended in chaos when Boca were thrown out of the competition after their fans used pepper spray on the River players. River took a 1-0 lead to La Bombonera and that slight advantage remained at half-time. However, there was no more action as the visitors were sprayed on their return to the pitch. While the players were treated for the after-effects, the match was suspended and River were subsequently awarded a 3-0 win. Eight months on from River's first victory at La Bombonera in 10 years, River inflicted another defeat on Boca in the Copa Sudamericana semi-finals. After a goalless first game, River returned to El Monumental and ground out a 1-0 victory thanks to Leonardo Pisculichi's 16th-minute strike. That proved decisive and River duly celebrated knocking Boca out of an international competition for the first time in 28 years. One of the most remembered Superclasicos at La Bombonera came in May 2000 when a star-studded River side were humbled by a Juan Roman Riquelme-inspired Boca. River lined up with the 'Fantastic Four' – Pablo Aimar, Ariel Ortega, Javier Saviola and Juan Pablo Angel – in attack and boasted a 2-1 lead from their quarter-final first leg. It was Boca moving on in the Copa Libertadores, though, as Boca produced a sublime second-half display to win 3-0 and take the tie 4-2 on aggregate. Riquelme's sensational nutmeg on Mario Yepes remains fresh in the memory of Boca fans, while Martin Palermo's late goal after making a dramatic return from six months out with a knee injury cemented his place as a club legend. Affectionately known as the 'Orange Ball Superclasico' the meeting in 1986 came a week after River had secured the league title. Despite requests from Argentina president Raul Alfonsin, the River players chose to celebrate prior to kick-off with a lap of honour at La Bombonera, a move that caused anger within the Boca fans. Concerns about trouble did not materialise but the game was forced to be played with an orange ball after Boca supporters threw so much white paper onto the pitch the original ball could not be seen. River went on to win 2-0 thanks to two goals from club legend Norberto Alonso. It would not be a Superclasico without some mention of Diego Maradona, the superstar who chose his beloved Boca over River when moving from Argentinos Juniors. Maradona's first encounter with River as a Boca player came in April 1981, the mercurial playmaker scoring one of the most iconic goals in the fixture's history. Having controlled a cross from the right, Maradona jinked past the sprawling Ubaldo Fillol before tapping into the River net.